To this day, I regret skipping over The Rolling Stones’ U.S. tours that took place every three years from 1969 through 1978. Even if I tried, tickets for their New York area shows back them were tough to get. Living in Texas in 1981, it was easy though for me to be among the 100,000 at one of their two shows at the Cotton Bowl in Dallas. Following two successful and critically-acclaimed LPs, Some Girls and Tattoo You, the latter boosted through MTV, 1981 was a peak time for the Stones. The Stones enterprise put a lot of effort into this tour which proved to be landmark in setting the mold for future big stadium shows. It was also the first to attract a major corporate sponsor (fragrance-maker Jovan for a cool million) and went on to become the highest-grossing concert tour to date. Like most stops on the tour, the Dallas shows were on the weekend during the day. Mine was the second of the two and was held on a football Sunday. (The hometown Cowboys were playing away in Philadelphia and over the weekend Mick sported both teams’ jerseys.) The Stones’ practice was to employ prominent local acts as openers, and Dallas featured great sunny afternoon sets from The Fabulous Thunderbirds and ZZ Top. By the time the Stones took the stage late afternoon, the sun started to set and the weather got chilly. Our seats in the upper deck near the front were in the shade. This meant we froze while those on the other side in the sun fared much better. It got so cold that one of my friends retreated back to the car to watch the Cowboy game on a portable television. To date, this is by far the largest crowd I have ever been a part of, and I can’t say that I really enjoyed watching a band through binoculars from such a distance. Despite the elaborate stage backdrop and powerful sound system, there were no big screens at shows yet. It took theatrics such as releasing balloons and having Mick ride atop a cherry-picker to liven things up for those of us so far away. While I was excited to finally see the Stones live (I saw them again twice before their high ticket prices became offensive. ), I recalled little about the music. 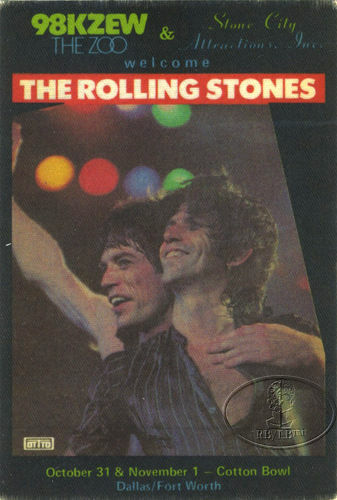 Since the Stones recorded every show for their customary live tour record and film, it was fairly easy to find a bootleg soundboard recording of this show. Listening again some 30 year later, I was surprised at how dull and uninspiring they sounded. For starters, the Stones pretty much played the same set list every night of the tour—how sad and boring for a band with such a vast catalog. But more so, Jagger’s singing was just downright flat. It sounded forced and hurried over a band that at times were sloppy. The only bright spots to my ear were some occasional hot guitar bursts from Keith and Woody. Behind the enormous crowd and the giant spectacle of it all, that soundboard recording revealed that there just wasn’t much life to this show. Maybe that’s why the tour document live record is called Still Life? It seems like this may have been a tour more for the family trust funds than the music. My ticket from that concert says Saturday, October 31, 1981 Noon. The day I went there was a downpour which made the concert even more fun. Saw one of my first “crowd situations”: I was sitting in the stands with a good view of the packed field. After the Fabulous Thunderbirds & ZZ Top played the barricades close to the stage were removed and the entire field of people just rolled forward like a massive wave.of water. Whatever you had with you on the field got left behind you about 10 feet. Thx for the memory… the downpour definitely added to the vibe of that night. I remember the crowd actually booing when the Stones came out, remember…this is TEXAS and ZZ ruled!! Ended up being a great show despite the weather, one for the ages!! They played both nights. I went to the 2nd show on Nov. 1 because I had to work the day before, and drove down from Tinker AFB, OK immediately after work to make sure I was at the concert. ZZ Top blew the Stones off of the stage!!! I thought the Rolling Stones kinda sucked and were uninteresting, but still I am glad that I was able to see them. You should have gone to the concert the day before (on Halloween). It was mind blowing. I had heard somewhere that the Stones said their Halloween concert was the best show of the tour (despite a torrential rain), and the next day’s was the worst. Your comments seem to confirm that. I was there on the 31st show and can tell you, as an 18 yo at the time, I was not a stones fan before that show. They blew me away. They played in the cold rain and got soaked like the rest of us…but they were the Stones and never had to, no one would have thought different. Big fan of their road show ever since.